Casablanca sits on the Atlantic Coast of Morocco and is the largest city in the country. It is a top cultural, economic and port city as well as being the financial centre of Morocco. The city also has plenty of history to enjoy and this varied and interesting history features in many of the Casablanca tours. The original settlement that we now know as Casablanca was founded by the Berbers in the 7th century, if not before. The Phoenicians and Romans both used the port area before the Berbers created a settlement. The town was an independent state in the 15th century before the Portuguese arrived and built a military fortress. It was abandoned in 1755 following an earthquake. The modern city boomed under French times when the textile industry and shipping became important – this was when mint tea started to be exported to Britain! Morocco finally gained independence in the 1950s and since then the modern city has evolved to be a financial and cultural centre. This is a four hour guided tour that lets you see the best of the city of Casablanca, the historical and economic heart of Morocco. The tour will include many of the historic sites and the best of the modern city including those amazing white houses along the coast of the Anfa district. It also includes the United National Places, Mohammad V Square and the Central Market as well as the Royal Palace, the Cathedral Notre Dame de Lourdes and the Hassan II Mosque. The Hassan II Mosque is one of the outstanding sights of Casablanca and definitely worth a comprehensive tour which this offers. The mosque took seven years and 10,000 craftsmen to build and is a massive tribute to the former king of Morocco in the Moorish architecture style – while still having plenty of 20th-century innovation and equipment involved. It is finished with a spotlight that shines to Mecca and a 700 feet tall minaret. This tour takes you around the mosque with a professional guide and includes the entrance fee. 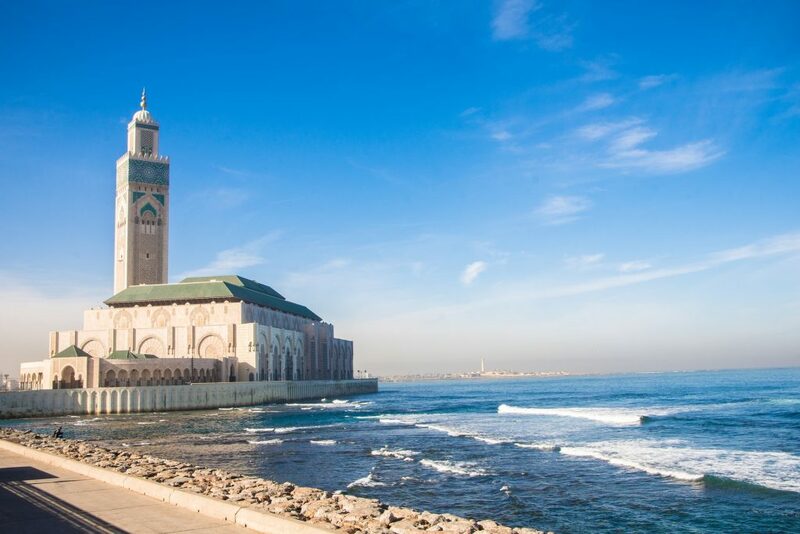 Casablanca tours have plenty to see and this four-hour tour includes the most important sights of the city on a sightseeing and walking tour. It starts with the Anfa district and its famous white houses then moves to the Habous district with its narrow arcades and maze-like traditional streets of the medina. You will then see notable sights such as the United Nations Place, the Mohammad V Square and the Central Market with the Royal Palace close by. Then see the Notre Dame de Lourdes cathedral and the famous Hassan II Mosque, the two different hearts of religion in the city. Before the tour finishes, you can even do some shopping at the new Morocco Mall on the seafront. This seven hour tour explores the Jewish Heritage of Casablanca and includes the synagogues, cemeteries and monuments associated with the Jewish population of the city. Casablanca is home to the biggest Jewish community in the country and has some high quality Kosher restaurants to visit. The tour includes visiting Mellah, the Jewish Quarter then the Museum of Moroccan Judaism with its religious, artistic and ethnographic exhibits. A stop at a local Kosher restaurant is followed by a visit to the Hassan II mosque, the third largest in the world before a tip to the Habous Market, known for its local crafts and woodwork. Casablanca is also a great spot to use as a base to go beyond the tours of the city and see a little more of Morocco. There are a few day tours as well as longer tours to see the best in the country. If you are staying for a longer vacation in Morocco and want to go further than the Casablanca tours available, then this impressive 7-day tour is worth checking out. It starts out in Casablanca and visits the Hassan II mosque before moving to Rabat, with its Kasbah, Oudaya Gardens and Royal Palace. Next, visit the Roman ruins of Volubilis and see what life was like in Morocco in these times. The tour then moves to Fes, seeing the largest walled medinas in the world. See the spice markets, Berber carpets and works of art before visiting the King’s Palace. Marrakech is the next stop with a pause at the Ouzoud Waterfall. See the Djemaa el-Fna in the centre of the city, with its entertainers and barbeque pits. Also see the Palace of the Bahia, the Saadian Tombs and the Koutoubia Mosque. The final day is in Marrakech where the morning is free, and the afternoon returns to Casablanca. If you are based in Casablanca for your Morocco vacation, this is a great chance to also visit Tangier. The tour is eight hours and includes high-speed train journeys to and from Tangier. Arriving there, you will tour the city seeing things such as the Spartel Cape and Hercules Caves as well as visiting the Kasbah district close to the port. Finish with a visit to the Medina and the Minaret before passing sights such as the Grand Socco before returning to the train station. This one day tour visits Marrakech and includes a comprehensive walking tour around the medina, the old fortified city and the Palace of Bahia. See the Jewish Quarter with its distinct architecture, the Saadian tombs and the Islamic College of Ben Youssef Madrasa. You then visit the Koutoubia Mosque before stopping for lunch. The afternoon includes the Berber Museum and a return trip to Casablanca. This trip is to visit the holy city of Fez where you can have a guided tour of the main sites. See the medina, with its religious schools, university and the Mosque of Al-Karaouine. You will also visit the Nejjarine Museum of Wooden Arts and Crafts and have lunch in a local restaurant. Outside the medina, you will see the Royal Palace and the Bab Fattouh cemetery with its stunning views of the city before returning to Casablanca.